Baroda, also known as Vadodara, situated on the banks of Vishwamitri River, is one of the popular and most populated cities of Gujarat. The city has glorious history and offers ample tourist attractions, like temples, museums, ancient palaces and lakes. November to February- The cold winds from North make the weather quite pleasant during these months. The temperature ranges between 12°C to 36°C. It is one of the best times to visit the city and wearing light woolens is suitable in this weather. March to July- the average maximum temperature is 40°C and the average minimum temperature is 23°C. The weather conditions are hot and dry during these months and it gets the hottest in the month of May. June to September- Because of massive rainfall from south west monsoon, the city experiences increased humidity that can sometimes be uncomfortable. Wearing cotton clothes is advisable in this weather. Pleasant January is considered as the coldest month of the year, offering pleasing days and relatively cool nights and making this period ideal for planning a trip to Baroda. Clear skies bestow ample sunshine, making the weather appropriate for travelling across the city and indulging in outdoor tourist activities. Those travelling to this region are advised to carry light warm clothes. Moderately hot Dominated by balmy days and pleasant nights, February proffers one of the perfect times to enjoy holidaying in this vivacious city. Gentle winds blowing in from the North offer mild atmosphere, favorable for participating in outdoor tourist activities and carrying out city tours to explore well renowned historical sites and other places of interest. It is a good time to find out what the city has to offer. Moderately hot The month of March marks the beginning of summer season. Days are warm while nights can be pleasing. Skies remain clear for most of the days. The temperate weather is suitable for enjoying sightseeing and exploring nearby attractions; however, one might have to face some difficulty while indulging in outdoor activities. Make sure to carry water bottles and sun protective gears when travelling here. Very hot Temperature begins to soar above comfortable range in April. While days are tremendously scorching, nights are mildly warm. Enormous amount of heat leads to harsh weather conditions that add to the trouble for those who plan to venture out in the sun. Outdoor activities and day trips are hindered due to blistering heat. This period is, thus, not recommended for tourism. Extremely hot The inconvenience caused due to summer season is at its zenith during this month. Extremely hot weather conditions prevail in the region. Clear skies impart blazing heat that makes it challenging for the tourists to take pleasure in outdoor activities. However it is a good time for budget travelers, as discounts on holiday packages and accommodations are offered during this period due to off-season. Very hot The city continues to remain under the influence of summers. While blue skies preoccupy the region with ample sunshine, it is difficult to escape from hot winds during nights as well. Sightseeing and other tourist activities are affected because of excessive heat and sweaty weather conditions. Occasional rainfall can be expected as monsoon arrives in the region by the mid of this month. Rainy Temperature tends to lower down in July due to the monsoon showers bringing relief from burning heat. The atmosphere becomes moderately hot. Skies are mostly cloudy, often accompanied by thunderstorms. Frequent downpours and humidity hitting the highest point during this time might restrict outdoor trips and city expeditions. However, rain lovers can take pleasure in exploring the incomparable natural beauty of the region. Rainy Monsoon showers continue to drench the city and mercury scoops down to a comfortable level, offering pleasing days and comfortable nights. Travelling and other outdoor activities are still difficult because of rainfall and sultry weather. Most people do not prefer visiting Baroda in this month. But for those planning a trip, carrying light cotton clothes and rain gears is recommended. Rainy The region experiences mildly hot climate, as downpours continue to hit the city. While skies remain cloudy for a few days, there can be many days without rain. Oppressive weather can interrupt outings and city tours at times. However, the pristine beauty of the place can be best explored in this month. Make sure to carry umbrellas when venturing out. Moderately hot Monsoon completely seizes by the beginning of October. The sky gets clear and sun shines through. Post-monsoon season allures a large number of travelers as temperate weather conditions offered by this month are favorable for indulging in outdoor activities and taking up day trips. Natural charm of this place, enhanced by lush green surroundings and breathtaking landscapes, is also worth exploring. Pleasant Pleasant climatic conditions in November make this place suitable for tourism. The sky remains clear for most of the days, offering a good season for engaging in exciting outdoor activities. Sightseeing and travelling to nearby attractions is also enjoyable. 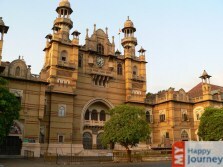 It is one of the perfect times to take up holiday packages and make your trip to Baroda all the more fun. Moderately cold December marks the advent of winter season, which is not extreme here. Pleasant ambience favors vacationing and welcomes a large number of tourists from all around the world. While days are balmy, temperature dips down after sunset, resulting in cold nights. Dominated by cool breeze, coming from the North and temperate weather conditions, this month offers a good time for sightseeing and enjoying other outdoor activities.